Okay, so you knew about Rosa Parks. But did you know that there were two other women arrested before her because they wouldn't give up their seats on Montgomery's segregated buses? Did you know that the Montgomery bus boycott lasted over a year and that many people walked miles each day just to get to work or school or piano lessons? 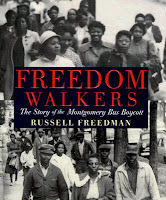 If you think you know about the Montgomery bus boycott, you might want to pick up this book. If nothing else, it's got tons of photos that bring the people involved in the boycott to life. And who knows? You might just learn something. I mean... it's Russell Freedman. Of course it's going to be well-written, accurate, and informative. It's definitely a compelling story, especially in light of the country's first black President being elected. What I wasn't expecting were so many great photos. They definitely brought the period to life, especially the many photos showing segregated areas. It seems so ridiculous today - how do you segregate a Coke machine?? But that's how it was. The kids who will pick this one up will find an accessible story and much to think and talk about. I do have to wonder how many kids will be picking it up, though. Even now knowing the story behind the cover photos, I think it looks like a dull book, and I don't think this will be the nonfiction book to win the Caudill award. That said, it's an important story to know and I'd recommend it to kids interested in history or studying civil rights in school. If kids want to know more about integration, I can highly recommend Through My Eyes by Ruby Bridges or Warriors Don't Cry by Melba Pattillo Beals (both are about school integration). Kids may also be interested in Freedom Riders by Ann Bausum, which is about young people testing the bus integration laws. Read another review of Freedom Walkers at Maw Books.